Not much to say here, drawn early it could be decisive but the most common day card I see, Hermetic Seal, is only cost 1 to begin with. Its a bit bland for me. Just like flood lights for agency except supporting night instead of day. Both are cards that will almost never see play. Night and day cards are too cheap to benefit from reduction or suffer too much from taxation. This won't have an appreciable effect on your opponent's play, since it will trigger maybe once or twice a game if you're lucky. The second ability feels like a trap option. There aren't really enough Night cards to make this appealing to use en masse, so it generally doesn't justify the use. 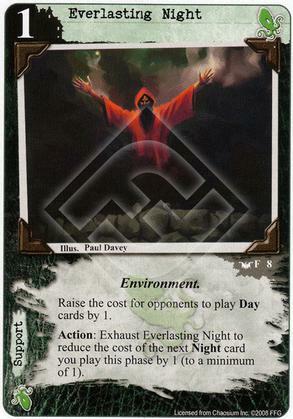 There are a few Night cards that would be nice to get out cheaper, but not at the cost of having an otherwise-lackluster card in your deck.